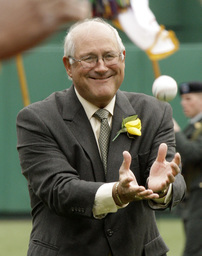 PITTSBURGH (AP) Steve Blass' 60th season with the Pittsburgh Pirates will be his last in the broadcast booth. The former pitcher announced Tuesday that 2019 will be his 34th and final year as a color analyst. He will step away as the longest-tenured broadcaster in team history. Blass will remain with the club as an alumni ambassador. The 76-year-old Blass joined the organization after signing a professional contract with the club's affiliate in the Appalachian League in 1960. He made his major league debut with the Pirates in 1964 and spent a decade in the majors, going 103-76 with a 3.63 ERA in 282 appearances. The defining moment of his playing career came in the 1971 World Series when he pitched a four-hitter in Game 7 against Baltimore to lead Pittsburgh to a 2-1 win and the title. "Sixty seasons with the Pirates, one organization in one city, I am so very proud of that. It ranks right up there with anything I have ever done on the baseball field," Blass said in a statement. "It has been a wonderful run." Blass retired in 1975 after a baffling loss of control that became known as "Steve Blass Disease." He returned to the club as a part-time analyst in 1983 before joining the broadcast team on a full-time basis in 1986. His folksy delivery and penchant for sharing offbeat stories from his playing days became a fixture of broadcasts. "Steve is as synonymous with Pirates baseball as anyone in the history of our organization. Steve leaping up into the air following the final out in his second complete game victory of the 1971 World Series is one of the most iconic moments in Pirates history," Pirates owner Bob Nutting said in a statement. "For 60 seasons, Steve has represented the Pirates with humility, grace, pride and passion. Words cannot express how appreciative we at the Pirates organization are for his dedication or how beloved he is and always will be." The team will honor Blass throughout the season and is planning an on-field send-off for Blass before the Pirates host Cincinnati on Sept. 28.